The UK’s solar and storage industries are being urged to throw their full weight behind a new campaign against government plans to end the export tariff. Groups including the Solar Trade Association, 10:10, WWF and Community Energy England have launched the ‘Fair4Solar’ campaign, which is aiming to reverse planned cuts to fair market payments from new solar installations which export excess power to the national grid. The STA said the plans had sent shockwaves “far beyond the industry” and flew in the face of new EU legislation. More than 300 organisations have signed a letter to energy minister Claire Perry, but the STA is now urging all interested stakeholders to join the lobbying efforts and contact their own MP. Leonie Greene, advocacy director at the STA, said: “It is vital that we retain the export tariff and we urge everyone who cares about solar power and the rights of everyday people to participate in the clean energy transition to join our fight for fair treatment for solar power." 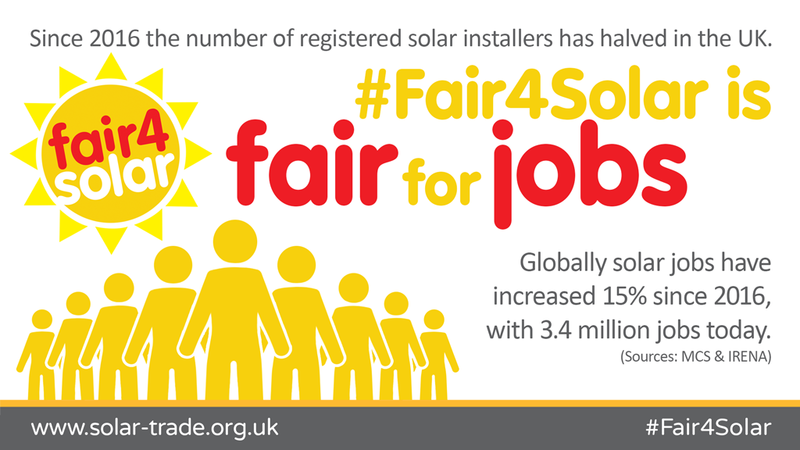 For more information on the campaign and to get involved, contact the Solar Trade Association or 10:10 Climate Action. Alternatively, the STA will be on-site at this week's Solar & Storage Live.